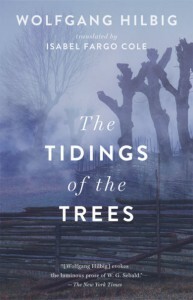 At first blush, Wolfgang Hilbig’s The Tidings of the Trees hones in on a writer’s failure to write: “these drafts . . . have become the only ground on which I can still move,” says Waller, the novella’s elusive protagonist, “these drafts besiege me like an impenetrable barrier.” He specifically complains about the only sentence he’s been able to pen in a long time, a sentence seemingly “fated to have no echo: The cherry lane has vanished.” It alludes to a series of trees that once lay by a road in the outskirts of town. Waller cannot recall exactly when they disappeared; likewise, there’s “an infinite series of stories telling how this happened.” He sets out to explore some of these alternate scenarios by revisiting the trees from different spatial, temporal, and narrative angles. The shifting verb tenses—from present to simple past to past perfect—and narrative voices—from “I” to “he” to “we”—reveal the protagonist’s shaky sense of where and when and who he really is. This threefold confusion transcends the merely personal: it is, we soon discover, fundamentally political. Twenty years ago, the GDR built a wall and strengthened its borders; Waller’s early musings on “the only ground on which [he] can still move” and its “impenetrable barrier” turn out to be as much about this hermetic republic as about his writer’s block. Socialism, he laments, has restricted not only space but time, and with it, personal identity: by “treating history roughly,” it has brought “a revolution of forgetfulness” upon the people. Close to these intriguing figures and far from the state’s ideological constraints, Waller seems able to write again: “only now did I think I knew the next sentence that was called for. The shame is over!—That was the sentence.” Thus, in just under a hundred pages, the protagonist traces a redemptive arc from artistic defeat to political defiance. Writers writing about writing run the risk of alienating certain readers; writers writing about politics will sometimes feed us narrow partisan lines, thereby flattening an otherwise rich narrative. Hilbig is talented enough to avoid these traps. Far from building walls between us and an aptly named protagonist, the novella’s puzzle-like structure allows us to partake in Waller’s own disorientation; to empathize with his struggle. It is, after all, a deeply relatable one: to find our voice—our sense of self—we must all challenge limits set by others. This already powerful message is bolstered by Hilbig’s stunning prose; it is clear that he, at least, doesn’t struggle to write. 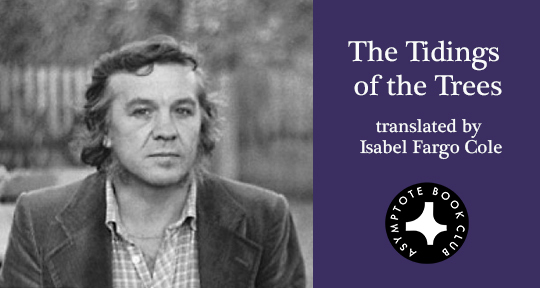 The same could be said of Isabel Fargo Cole: her English rendition of the novella reads so smoothly that it seems as though she could have written it from scratch herself—the ultimate mark of a world-class translation. Josefina Massot was born and lives in Buenos Aires, Argentina. She studied Philosophy at Stanford University and worked for Cabinet Magazine and Lapham’s Quarterly in New York City, where she later served as a foreign correspondent for Argentine newspapers La Nueva and Perfil. She is an academic English editor for Scribbr and a Spanish-English translator for Dalkey Archive Press; her translation of C.E. Feiling’s novel El mal menor will be published in 2019.